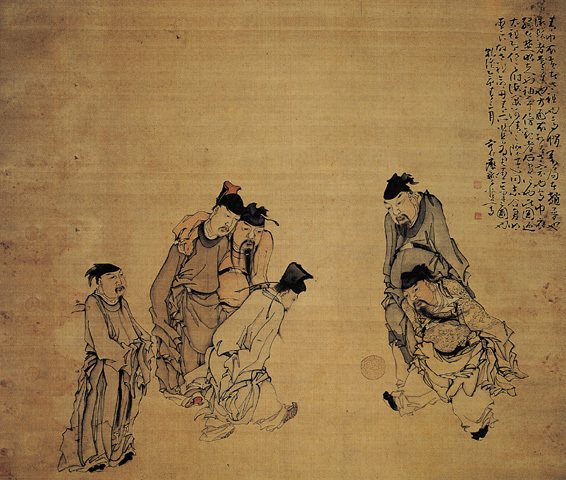 A painting depicts Song Dynasty Emperor Taizu, Emperor Taizong, prime minister Zhao Pu, and three ministers playing cuju, a medieval Chinese sport with similarities to soccer. Four men stand to the left, with the emperor and another to the right. They watch as Emperor Taizu kicks the ball to one of the ministers. Chinese characters are written in the upper right corner of the page. This painting is the work of Huang Shen, an 18th century Chinese painter from the Qing Dynasty. It is a reproduction of a 14th century work by Qian Xuan. The sport depicted, cuju, underwent an explosion in popularity during the Song Dynasty (1960–1279), the period in which the original work was painted. During the Ming Dynasty (1368–1644 AD) its popularity dropped, leading to the eventual extinction of the sport. At the time of this painting, the sport was no longer in wide practice. Qian Xuan’s original work is linked below.